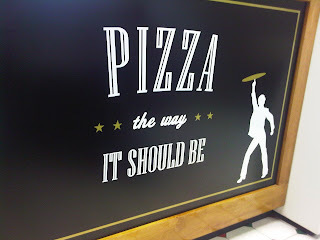 If there's one thing Wellesley has plenty of it's banks and pizza places. The latest addition is Old School Pizza which takes up space vacated by College Square Pizza which mysteriously disappeared last year. According to The Townsman's Teddy Applebaum Old School is owned by Joe Perdoni Jr. with help from highly regarded Tutto Italiano's Bobby Palizzolo. Though they don't have delivery (yet) we decided to try Old School for this week's Family Pizza Night. How was it? I'm glad you asked. A little pricey but we could have kept he cost down if we'd gotten 1 large instead. I wanted to try a couple different pizzas so I think it was worth it. Good start. Pick-up was a little hectic. We had to pay for parking across the street and there was a line for pick-up. Our food was ready by the time we got through the line, we got what we wanted, and it was still warm by the time it got home. 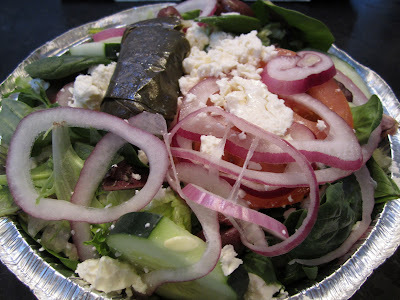 The Greek salad was nicely loaded with toppings including stuffed grape leaves. The dressing was typical pizza house quality. A good salad for $6. The White Clam pizza is described as coming with "Whole Belly Clams, Grated Cheese, Fresh Garlic & EVOO, Basil & Shaved Parmesan." I'm not a big clam guy but visually the pizza looked and smelled delicious. Our 6 year old blurted out an unsolicited "this is better than Upper Crust!" My wife said it was "garlicky" - and she likes garlic. I went with a simple mushroom pizza wanting to compare it to one of my favorite pizzas I've had the past year - a mushroom pizza from Upper Crust paired with a 2006 Radio-Coteau La Neblina Pinot Noir. The combination of earthy and slightly sweet notes in each combined with their focused flavors was a brilliant pairing. That said, I think the Old School mushroom pizza was better. The mushrooms were sauteed to perfection, and the crust found that perfect combination where it's crunchy on the outside but still soft on the inside. And the sauce - the sauce! Ripe tomato flavors with a touch of sweetness with the perfect amount of saltiness for my taste. I can't think of a better sauce I've tasted. A delicious pizza. Old School Pizza is a welcome addition to the crowded Wellesley pizza scene. Add delivery and we'll look forward to trying them again. I thought the simple mushroom pizza was delicious and some of the "Favorite Pies" on their menu look intriguing. Why doesn't anyone eat at the CPK in Wellesley? good review, can't wait to try the new place, thanks! Awful old school new england pizza. Cutting greasy greek pizza into triangles does not make it Italilan. After 2 bites and watching the grease run off onto the plate, both slices went straight into the trash. Sounds good, we will have to check it out, I am a big fan of Tutto. I found the pizza to be very greasy and just not a very good flavor. They dont seem to have a very good handle on customer service either. You have taken an amazing step to be promoted among the school students and they can learn new ways about rush essay service which is new and very helpful for the graduates and new commers.